Lately it has been a little bit too silent in the FPV antenna market. Luckily TBS (Team Black Sheep) decided to break this silence and come out with a new antenna set, specifically designed for mini quads. The new TBS Triumph antenna has a unique design, which makes it hard to be mistake with everything you have seen in the FPV antenna market for now. This article is just a little write up of my impressions of the new TBS Triumph antenna set*. 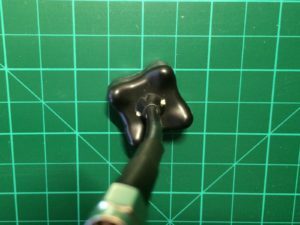 I own the antennas for about two months up to the point this review is written and had some time to test them out in multiple different scenarios. 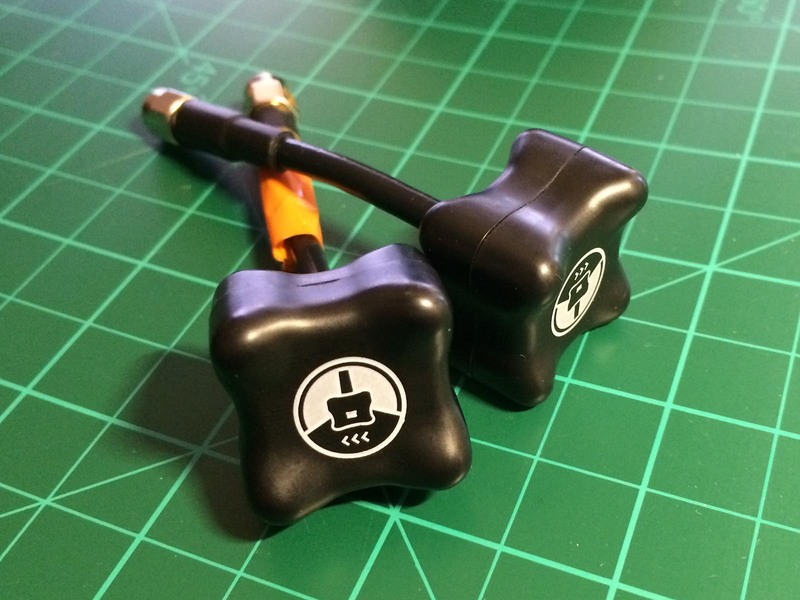 The antenna set has been bought in the free market and is no review sample provided by the manufacturer. Therefore I will be as honest and objective as I can, Before we continue, let’s have a look a the technical specifications of the new TBS Triumph antennas. 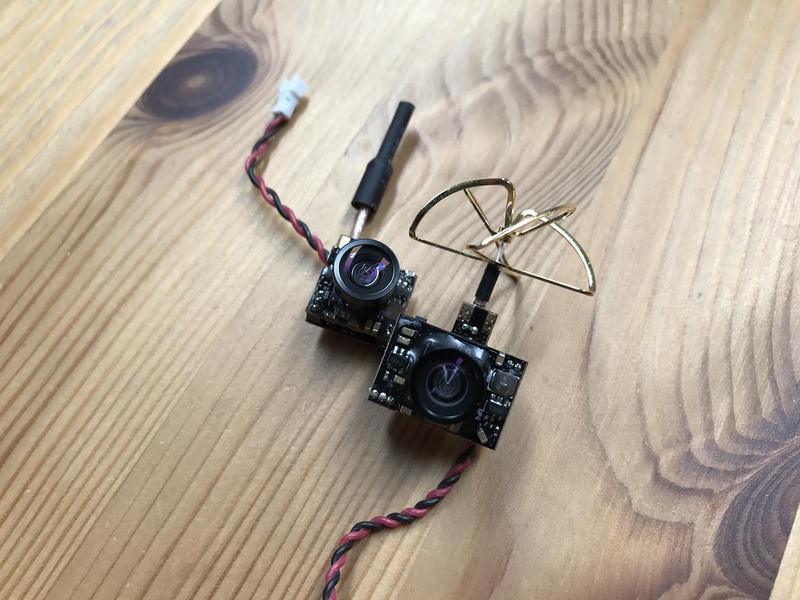 The antenna set consists of two identical circular polarized antennas, which are tuned for FPV video signal transmission in the analog 5 GHz band. TBS specifies a working frequency range from 5500 to 6000 MHz. See our FPV frequency guide for legal FPV applications in Germany (in German). The total gain of the antenna is 1.26 dBic. The unit dBiC is used to specify the gain of any circular polarized antenna relative to a perfect circularly polarized and perfect isotropic antenna. This means that the TBS Triumph has a radio emission profile of a donut, equally covering the area around the quad, but not so much exactly above or below the aircraft / the antenna. These antennas often also are called terms like skew planar wheel antenna or cloverleaf antenna (because of the looks of the internal antenna). You can buy the TBS Triumph as right hand polarized and left hand polarized version. For our testing we used the RHCP version. There also is a short version available, which reduced the original height of 85 mm down to 50 mm. This shorter FPV product variant is called TBS Triumph-Stub. The „Stub“ also reduced the antenna’s weight from 11.5 g to 8.5g – 9.8g. In terms of connectors you can choose between RP-SMA and SMA connection. 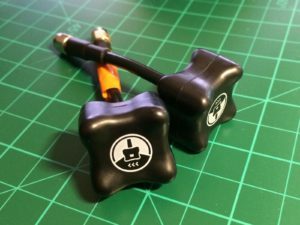 For more details about the different high frequency connector used in FPV racing, please have a look at our RC hobby connector guide (in German, but pictures will help you out). 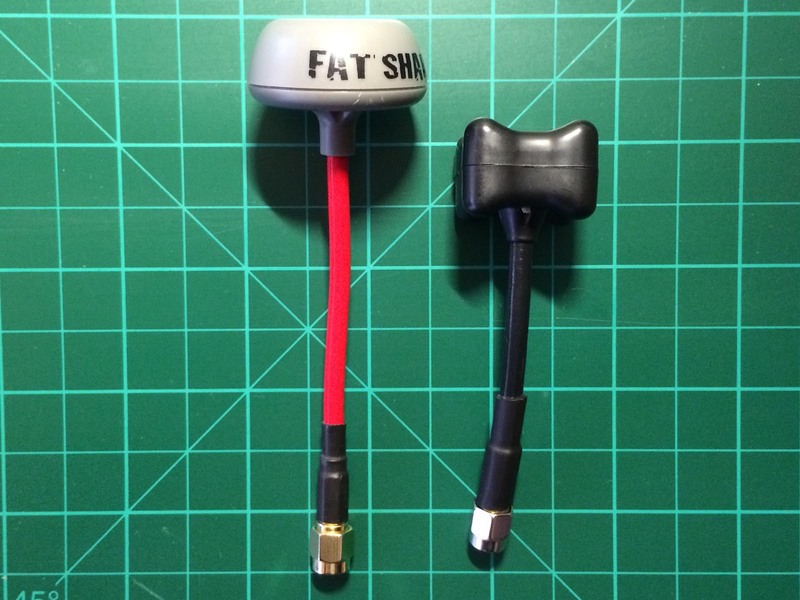 The Triumph antenna has been developed in a cooperation between FPV expert IBCrazy and Team Black Sheep. 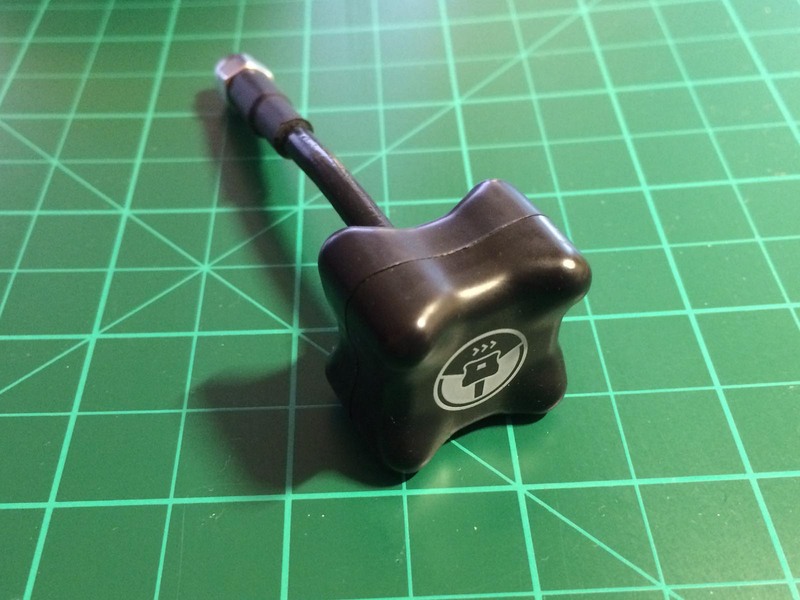 The antennas come in a overall black design, which has some white / grey-ish prints on the antenna head. On the one hand the black color looks good on full CFK frames, on the other hand I already learnt the hard way, that having a colorful antenna makes it a whole lot easier, if it ever should get lost. (For those of you, who are interested: I lost the antenna mid-flight on a a field of dozen of acres of knee-heigh grass. Magically I was able to recover the missing antenna with the help of a decently priced metal detector. It took some thorough analysis of the FPV feed recording and some mad triangulation skills to narrow down the estimated location of the „antenna drop“. From there it was walking in circles and listening to a annoying beeping sound for the next 70 minutes. It still worked and I recovered the antenna in the end. It is now marked with some bright orange tape.) 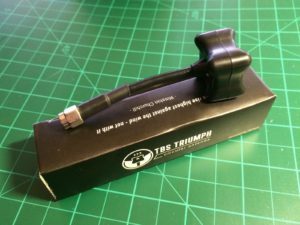 There now is an orange version of the TBS Triumph antenna* available that could have saved me some time and money, would it has been available by the time my quad decided to drop the Triumph. The cable used on the TBS Triumph is a RG402 coaxial cable, which can handle the intended frequencies without any problems by specification. RG402 cables are made for indoor and outdoor applications and can handle frequencies up to 35.000 MHz. Depending of the make power transmissions of up to 150+ W are possible at 5 GHz. Of course, those numbers are not really important for our FPV applications as we tend to „play around“ in the mW-area. (Everything else would be dangerous as well – Also please be advised to always cover your basis regarding local regulations on frequencies and maximum EIRP (equivalent isotropically radiated power). 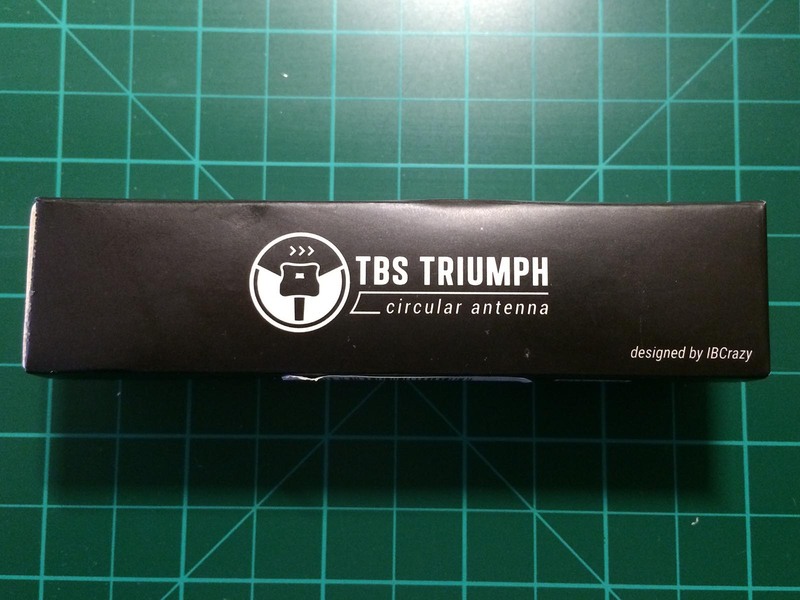 The TBS Triumph antennas* are delivered in the typical Team Black Sheep designed black cardboard box. Inside you will find nothing but a pair of your new Triumph antennas and two RP-SMA to SMA adapters. Update: I am not certain you still will receive adapters with the current version (January 2019) of the antennas as TBS is offering different products with RP-SMA and SMA connectors. You have to choose, which one fits for you before you place your order. Of Course, you still can buy an adapter later on, if you should find yourself in the position of a setup change. 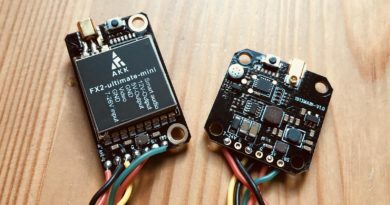 Besides the actual signal quality performance – we will discuss in just a second – I find it especially important for an FPV antenna to be easy to handle / position. My very first circular polarized antenna was a great quality Circular Wireless Skewed Planar Wheel antenna, which hat a very stiff cable. Positioning the antenna was only possible by adjusting the screw on the SMA connector. The ImmersionRC SpiroNet antennas* do a little better. The cable can be bent in any angle and stays in the selected position. Over time the used cable tended to get a little weak and the antenna kept bending back to its original straight shape. The TBS Triumphs are doing a better job on this matter. The heavy duty cable is flexible enough to allow decent positioning, but also holds the position upright under some resistance. I found that a real upgrade as I did not have to correct antenna positions after each other battery / flight. Judging video quality always is highly subjective. As I do not have any equipment allowing me to objectively measure the antenna performance, I am only able to tell my experiences so far. In general they fit the Fatshark Dominator V2 goggles* nicely, although I think the longer shaft of the SpiroNet* is an advantage on the receiver side. Simply because it enables better positioning of the antenna itself. On the quad the shorter design is a plus, of course. I wonder if it would make sense to sell a set with a regular-sized TBS Triumph and a TBS Triumph-Stub. At least this would be the perfect combination for my use-case. Video quality wise I noticed an improvement when flying in urban areas, e.g. on a sports field in a neighbor hood. Here I got less interference compared to the SpiroNet V2s. On my regular flying field, I found the picture to look a little better, but in terms of range there was no noticeable improvement. Of course, antenna performance is highly dependent on the characteristics of your environment. For my part, I can’t say that the TBS Triumph has solved all glitches in the video feed, but having a compact and robust antenna is a plus itself. Keep in mind that this is all on 25mW. So no magic is going to happen in terms of range, anyway. Receiver has been a TBS RX 5G8 module* for the Dominator goggles*. For video transmission I used a generic TS5813S 25 mW VTX, which has given me good video link quality in the past. I also tried my old TBS Greenhorn 25 mW VTX. All flying was done on the Fossils Stuff Gravity 280 quad (check out our built-log article) with the antenna bent by 80° out the back of the quad. The antenna has been connected directly to the VTX. No pig-tail or adapter has been used to avoid any unnecessary attenuation. The VTX was placed inside the HDPE frame and therefor got only very little airflow for cooling, which never has been a problem on 25 mW transmission modules so far. The TBS Triumph antennas* are a very well made set of 5.8 GHz FPV antennas, that don’t only look good, but also allow great handling due to their compact measurements. The price tag of around 40 Euros is very decent for this pair of antennas. You can buy antennas that perform worse, for more. In case of product features I like the really robust designate most. The antenna already took some bad hits and still stands up great. It also got lost during a flight once, and only has been retrieved from 20 centimeter high grass on a 60.000 m² field with the help of a metal detector (see above for details on that „fun“ story). The completely black „coloring“ didn’t exactly help on this. From now on my TX antenna has some bright orange tape on it. But that’s just me! 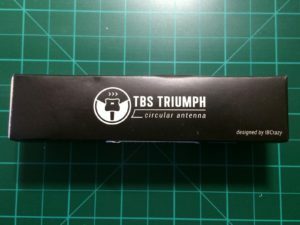 If you are looking for a new antenna anyway I would give the TBS Triumph a try for sure. It subjectively performs equally well and in some situations even better than my SpiroNet V2s and it has the same price tag. So go ahead and give it a spin. With FPV racing quads getting smaller and smaller the new TBS Triumph-Stub version is a nice addition to the TBS product portfolio you might want to consider getting over the standard 85-mm-version, if you are trying to save weight. 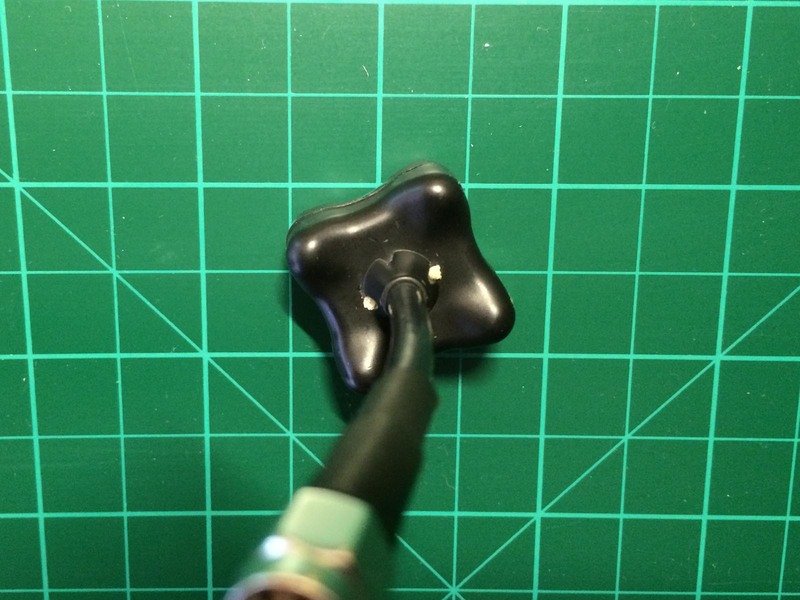 I also can see how you would use the small TBS Triumph-Stub on a FPV plane to minimize drag. 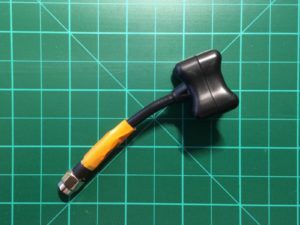 Update: For all those of you, who also experienced the fun crawling through knee-high grass looking for your BLACK Triumph antenna: TBS seems to have felt our pain an release a new Triumph antenna set in bright orange*!